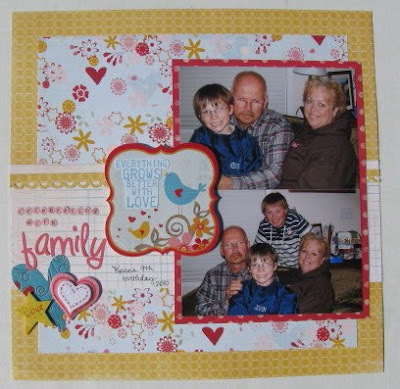 I loved working with the February add-on from Polka Dot Whimsy. I used the whole thing! I made a layout of the boys with my parents on Kevin's birthday back in November. I liked mixing up the patterns. Loved the combo of red, blue and yellow together. There was a fun mix of embellishments with stickers from Fancy Pants, some felt accents and two alphas fonts from Bella Boulevard. 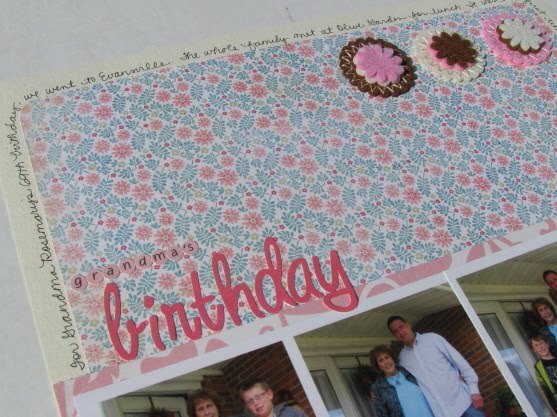 I used the more muted/pastel paper for a layout of my guys with Tom's mom on her birthday last September. The layered felt flowers from Ephiphany Crafts were a fun addition. I loved that they already had stitching on them. Instead of adding space for journaling, I just journaled around the page. 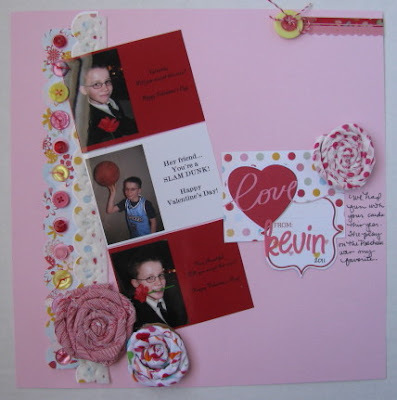 I used "a little bit of this...a little bit of that..." on this layout with Kevin's Valentine's cards. Felt, buttons, border stickers, trim...it's all on there. I even used the fabric from the kit to roll up into flowers. My title is made up of a couple of preprinted Fancy Pants journaling cards cut from one of the papers and Bella Boulevard alphas. 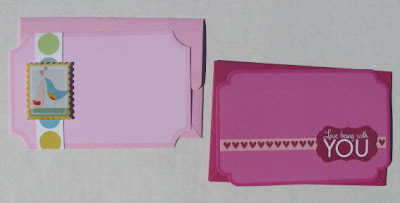 The kit came with a couple of notecards and envelopes. I had big plans to get creative and incorporate them into my layouts, but I forgot about them. Oops. Instead, I ended up using scraps to accent them. Super, simple little cards ready to go now. Love the layouts! Those rolled up flowers are so cute! Saw those in sb etc. just last night!